Last week I flew with Perimeter Airlines for the first time. It was the easiest flying experience I have ever had, and one of the shortest flights I have ever taken. No hassle, no long line ups, just a quick and easy no frills flight. Perimeter Airlines flies from Dauphin to Winnipeg early every weekday morning, and flies from Winnipeg to Dauphin early every weekday evening. It is a very short flight, less than 40 minutes in the air, and is a very efficient form of travel for business people, students, tourists, and locals. The Dauphin Airport is small but very adequate. Comfortable seats, friendly and helpful staff, and a fresh pot of free coffee greets you. As I waited for my scheduled flight I watched a couple helicopters take off and admired the sunrise as it peaked up over a water bomber. 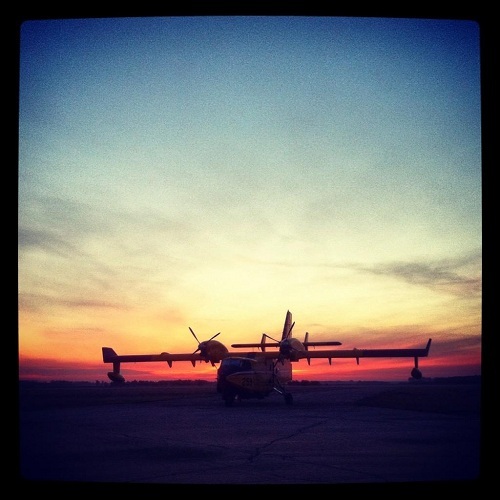 I watched as Perimeter Airlines landed in Dauphin and prepared for my flight. It was a small plane, but large enough for at least 10 passengers and their luggage. Myself and the other passengers were sent outside to board the plane - no body scanners, seat assignments or identification required - just flying the old fashioned way - really putting the fun back into flying. The co-pilot escorted us onto the plane, and handed us ear plugs to help with the noise. We settled into our seats and prepared for take off. Take off was very smooth and I knew I was in good hands with the pilot and co-pilot. It was at this moment when the flight from Dauphin to Winnipeg became extraordinary. The view was amazing! I could see Riding Mountain National Park in the distance. Its colourful autumn leaves looked stunning next to the crisp fall fields. 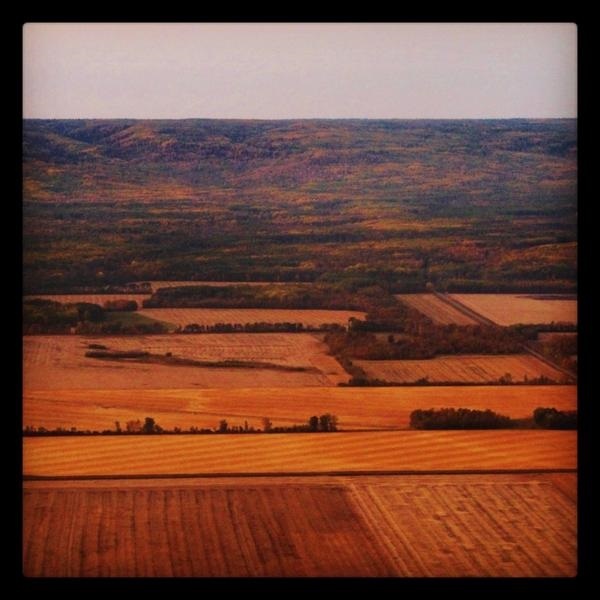 This bird’s eye view showcased all the beauty the Dauphin area has to offer, and certainly drove home the point that Dauphin is perfectly located beside such a fantastic national park. Only 35 minutes later I found myself once again admiring the beautiful Manitoba landscape as we descended through the clouds into Winnipeg for landing. I caught a glimpse of the city, its rivers, and a few of its famous landmarks, which all looked stunning from above. Landing was quick and smooth and before I knew it we were off the plane and escorted into the small Perimeter Airlines Airport. My luggage arrived in only 3 minutes, the quickest and easiest luggage retrieval I have ever experienced! Later that day I returned to the Perimeter Airlines Airport in Winnipeg for my return flight to Dauphin. Check in was very quick, and again no identification or body scan or security questions were required. The airport may be small, but it had everything I needed while I waited for my flight - a restaurant, comfy seats, and I even found an electricity outlet where I could plug my cell phone in for charging. My flight was called over the speaker and once again boarding the flight was quick and painless. Take off was smooth and again offered some great views of Winnipeg as we climbed into the clouds. It felt like only a few minutes of flying when the plane started to descend into the Dauphin area. This time, instead of beautiful autumn views of Riding Mountain National Park I was treated to the terrain of the City of Dauphin. I saw farmer’s fields, businesses, homes and churches as we headed in for a landing. Touchdown was short and sweet, and luggage was returned to me within a couple of moments. Flying from Dauphin to Winnipeg return with Perimeter Airlines was a real treat. It was an efficient and smooth experience filled with magnificent views of the Dauphin and Winnipeg area. I look forward to flying with Perimeter Airlines again in the future. For more information on flights from Dauphin with Perimeter Airlines please visit www.perimeter.ca.